KIS introduces new gameplay mechanics by adding a brand new inventory system and EVA usables items as tools. You want to build a rover on Duna from scratch? Or you've forgot to attach a solar panel to the planetary station? With KIS it's not a problem! The mod offers container parts of various size to deliver spare parts to the orbit or at the construction site. Tiny containers for light-weight rockets. Big containers for serious projects. Mk3 containers for really big constructions ideas! Kerbals now have own backpack to hold small items, and some of them can be equipped on the model. AR goggles? Fancy hat? Or, maybe, a completely new helmet?! It's all possible now! With special tools (provided by the mod) kerbals now can modifying teh existing vessels by adding or removing parts. It's even possible to build a whole new vessel from scratch! * Goggles, hats and helmets are provided by the third-party mods. E.g. "Kerbal Props". VIDEO: Debugging abilities for mod creators. VIDEO: Full support for part variants and TweakScale. Kerbal Attachment System (KAS). Need to link two vessels? 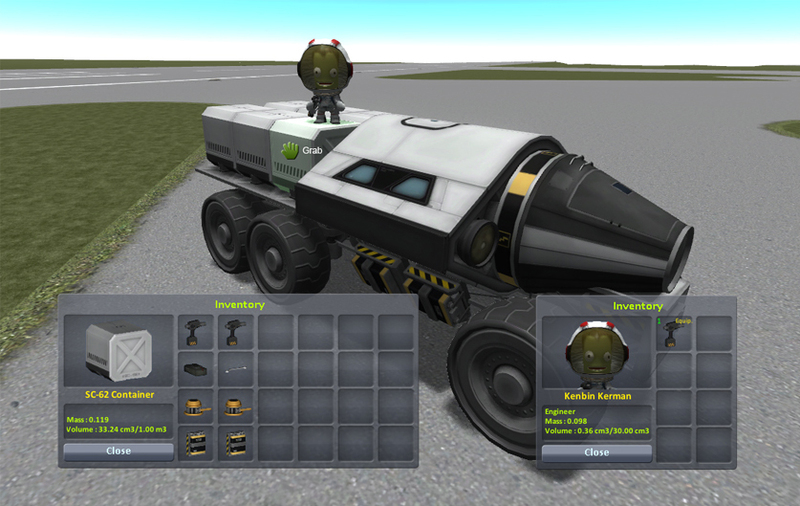 Just send out your kerbals EVA! Don't forget to update their inventories, though. 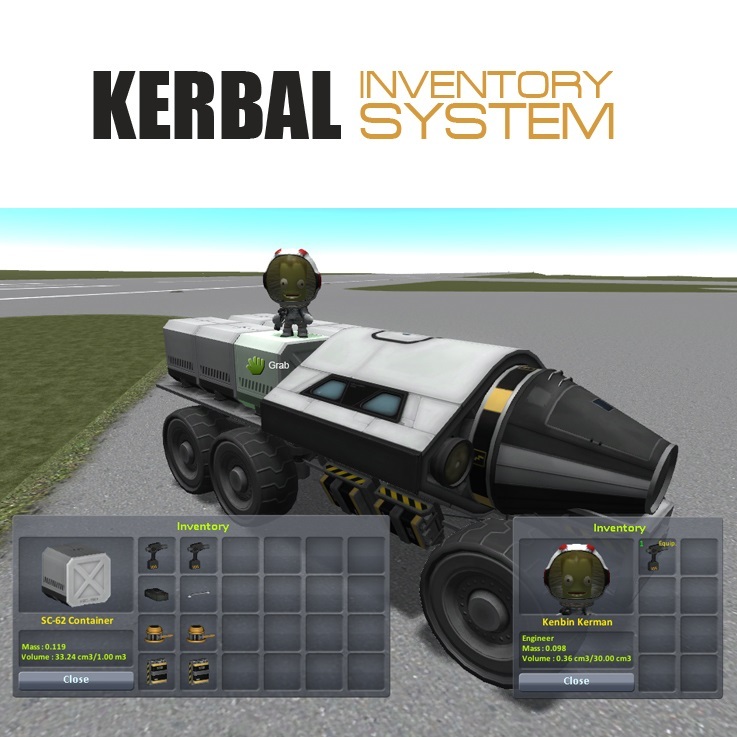 Search for "Kerbal Inventory System" or just "KIS", then install the mod. Occasionally run CKAN client to update KIS (and other mods) to the latest version. If you follow this path, then all the KIS dependencies will be updated automatically. It may save you a lot of time during the update. Verify the installation: the mod's LICENSE.md file must be located at <game root>/GameData/KIS/LICENSE.md. Find file remove_fun_part_patch.txt in the mod's folder. Move it one level up in the directory structure (into the GameData folder). Now the fun parts won't show up even if you update the mod. No. Last version for 1.0.5 was KIS v1.2.6. Try checking debug logs. If there are errors than that's the reason. If nothing helps, please, go to the forum and submit report with all the details: installed mods, version of KSP, logs, and screenshots. If you use DeadlyReenter mod then this is the issue: https://github.com/KospY/KIS/issues/151. It'll be fixed in the new KIS release. Is there a version for 1.1.2? 1.2.9 is 1.1.2 compatible. Minor versions are not mentioned unless they are really different (which they usually not). Thanks for the update to 1.1. my duna mission was doomed without it! I appreciate the mod, it is fun and useful ! Thanks for updating guys. having problems here, extracted files into GameData folder. I have the ISC containers show in the game but nothing else, the parts show in the tech tree, but are unavailable in game except for the ISC containers. the ISC containers are dropable into the VAB/SPH but are not working with a right click. I get no other errors show am I missing something? Is this working for anyone? I just got the game a few days ago and I cannot this to work. No inventory on my Kerbals or command pods and when I try to open the containers I get a sound file error and just a flash of the inventory. EDIT: NVM. Had it installed inside the Squad folder instead of Gamedata folder. Working now!! 2 - after less than a minute the attached devices explode.